First, I'd like to thank you all for the kind comments and emails you sent me about my two new patterns! Second, I'm SO excited to be visiting BERNINA's headquarters in Chicago March 25th-26th to teach at their Quilt As Desired Retreat. The incredibly knowledgeable Judy Hahner will be walking participants through the ins and outs of the BERNINA Quilting System and QuiltMotion Touch software and I'll be working with people quilting on domestic machines! (I'm keeping my fingers crossed for the 780!) We'll explore some simple backgrounds and learn how and where to place them to make complex looking designs. 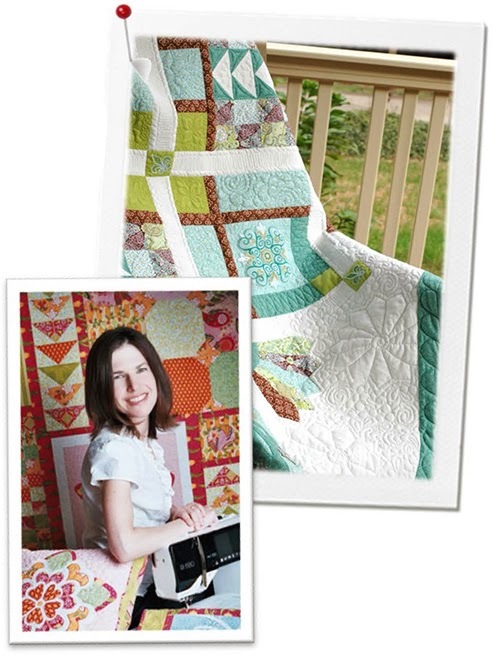 And we'll talk about how to create a great quilting plan for any quilt. I can't wait! They will have stitch regulators for everyone to try! And did I mention that BERNINA has decided to send participants home with a copy of the directions for the Sundance quilt! If you are interested you can register here! (I think that, on their site there are two different dates listed, Quilt as Desired is actually JUST available on the 25th-26th.) I hope some of you can join me. How fun! I'm so jealous - have a great time! Looks like fun...I love my Bernina 780!